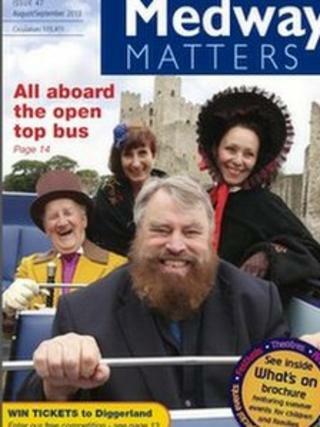 Medway Council has been accused of being biased in favour of the ruling Conservative Party in its free magazine. Medway Matters contains a page about the Conservative Cabinet members, but Labour group leader Vince Maple thinks other parties should also feature. The Tories said government rules state that councils can publicise the work of the executive. The bi-monthly magazine is delivered to 115,000 homes across the area. Mr Maple said he has asked for a page about Labour councillors in the next edition, which has been refused. "We're saying very clearly that it cannot be right that only one political party would be featured in any council magazine," he said. "It should either be all 55 councillors in the case of Medway, or none at all." Conservative Alan Jarrett, the council's deputy leader, denied the party was making political capital out of the magazine. "It's quite simple, there's a government publicity code that quite clearly sets out that councils are quite entitled to publish executive arrangements and details of the executive members and not of opposition members," he said. "Executive arrangements here in Medway just happen to be in the hands of the Conservative Party. "We're the people that run things, we're the people that deliver things, in the face of constant opposition from Labour. "The government's publicity code is being adhered to." The magazine costs more than £100,000 a year to produce, and was fully funded by advertising in the last financial year.